Your experience of Chobe will depend on which part of the park you visit. The waterfront area in the north, which is within a day trip of Victoria Falls, offers game viewing for the masses, with boats cruising up and down the Chobe River from many large lodges along the bank, and a busy network of roads. The game can be prolific – I have never see more elephants anywhere, and listening at night to more than 2,000 buffalo rumbling past our campsite remains one of my most awe-inspiring safari moments. But peak season crowds can be comparable to those of the Kruger and Masai Mara. The park’s hinterland, however, is a true wilderness – and those who can make it to Ngwezumba Pan and other scattered pans among the dense mopane woodland may find themselves alone. The sandy terrain makes for arduous travel – and the Maun to Kasane drive across the park is notorious for vehicle strandings. However, it is worth the effort for a visit to Savuti, an area in the southwest that is famed for its large lion prides and, during the rains, its impressive zebra migration. Game here can be seriously in-your-face and camping is not for those of nervous dispositions. With the resurgence of the mysterious Savute Channel, which has recently started to flow again after decades dry, this may once again become one of Africa’s hottest safari locations. Birdlife is excellent throughout Chobe, especially along the waterfront, and you have a fair chance of sable, wild dog and cheetah. 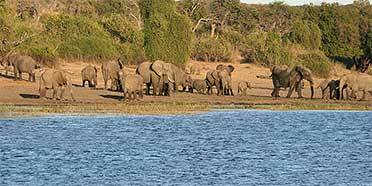 Chobe is justifiably rated as one of the premier game viewing parks in Africa. Although the rhino have been relocated to safer areas, everything else is here in abundance making it an ideal destination for the first time safari goer. I can’t list everything here but the herds of elephant and giraffe are exceptional and on my last drive into the park we were treated to lion, leopard, cheetah and wild dog all in the space of about 30 minutes. My favourite wildlife experience of all time was finding ourselves between two fine male lions about 50 metres apart who promptly set up a phenomenally loud roaring ‘contest’ for about 5 minutes. Hairs on the back of my neck as I write this! Everything comes at a price though. This superb game viewing means it gets very busy and you’ll often find six or more vehicles jostling for the best position around a very bored looking lion. The big lodges and touring groups all have their set routines so pick an independent operator who’ll find you the lion when the other guests have all returned for their breakfasts. Try to fit in Savuti Marshes too. For decades the marshes dried up completely but since 2009 they’ve flooded again bringing in hosts of new game and birds. Its location near the incomparable and unmissable Victoria Falls (about an hour away) has made Chobe one of the busiest and most famous parks in Southern Africa, but it’s the abundant wildlife and ease of seeing it (in both the rainy and dry seasons) that makes it one of the best. Except for rhino, you have a good chance of encountering all of Africa’s most-sought-after species, and the elephant density is amongst the highest in Africa. It’s also a good place to see some of the less common but most beautiful antelope such as sable and eland. Most visitors hit the Serondela area, near the town of Kasane, where the typical trip combines a beautiful boat ride on the park’s namesake river and a game drive. This isn’t the first park where I’ve done a boat safari, but it was by far the best, with the highlight being the baby elephants swimming. You can even choose to sleep on a houseboat. I bush camped which is one way to beat the Serondela crowds since there won’t be many other vehicles around during the late afternoon and early morning portions of your game drives. Another way to escape the masses is to visit the Savuti and Linyanti Marsh areas, which have water sources in the dry season and host many predators. I consider Chobe one of the very best safari destinations, not just in Botswana, but in the entire continent. Whatever the season, a game drive or a leisurely boat trip in this large and fascinatingly diverse park count among Africa’s classic safari experiences. Chobe is fantastic for elephants. Estimates of the size of the population vary – some hedge their bets by saying it’s over 50,000, while others suggest it’s over 120,000. I’ve often seen huge herds, up to 400 strong, in the mopane woodlands and lush swamps beside the Linyanti River and Chobe River, which marks the park’s northern boundary. Inevitably, there’s also much evidence of their destructiveness in well-trampled pathways and mangled trees. Lions are also plentiful, particularly near the waterholes, some of which have pumps to keep them replenished. Thanks to unusually high rainfall in recent years, the region around the Savuti Channel in the west has become a superb place to see birds, buffalo, leopards and streams of zebras. The marshlands of the Linyanti region in the northwest are even soggier; after the summer rains, rare antelopes such as red lechwe and sitatunga can be seen here. Chobe is divided into several distinctly different eco-systems where safari options vary. My experience of Chobe is a day or overnight safari to the lush plains and dense forests along the Chobe River in the northeast, and is a safari operators’ favourite that’s often teamed with a visit to Victoria Falls just over the border. The normal drill is a morning game drive, followed by lunch at a riverside lodge and an afternoon river cruise. Game drives are always rewarding; giraffe, zebra, wildebeest, buffalo, numerous antelope, and accompanying predators include lion, hyena and wild dog. But the highlight for me is the cruise; a gentle float to observe Chobe’s always-busy riverfront as the animals drink, and is rightfully best known for seeing impressively large herds of elephant. A popular short safari, but the other regions (definitely Savuti) beckon to experience Chobe well-off the beaten track. If you want to see elephants Chobe is the place. Stretching south from the Chobe River all the way down to the Moremi Game Reserve, this huge park is home to the biggest elephant herds on the planet. In all, some 120,000 elephants find refuge here together with large herds of buffalo and all the big cats. In the wet season the elephants disperse across the park’s wooded hinterland. But as the dry season takes hold they congregate in unbelievable numbers along the Chobe River, emerging from the bush to drink and bathe towards sundown. Although this is the busiest corner of the park it is well worth visiting, but I much prefer the area around Savuti, where Chobe blends seamlessly with the Linyanti Swamps. Savuti Marsh, an immense sea of grass encircled by distant walls of camelthorn acacias, attract tsessebe, zebra and other plains game, making this a happy hunting ground for cheetahs and lions, while the nearby hills hold the promise of leopards. An additional dry season spectacle is Pump Pan, a natural theatre-in-the-round where water from a borehole guarantees daily visits by elephant bulls and thirsty flocks of doves and sandgrouse. It is also renowned as the home of a lion pride whose members have become notorious for preying on the young elephants that accompany the breeding herds when they come in to drink at night. Chobe effectively covered the whole north-eastern corner of Botswana – a huge 11,700 sq km (4,517 sq miles), tucking into the borders with Zimbabwe, Zambia and Namibia. It has four very distinct areas but the vast majority of visitors do what I did, go in the dry season, when the animals cluster along the edge of the easily accessible Chobe River and huge herds of elephants browse the avenues on the edge of town. It makes gameviewing very easy and accessible, ideal for the first-timer. More importantly, for Botswana, because you are within easy reach of the larger hotels of Kasane, it also brings it down in price to a more affordable level. Gameviewing trips come in all shapes and sizes here, but my favourites were definitely the boat trips on the river, where you can not only see the elephants and lechwe (the trademark game species) but many of the staggering 460 species of bird found here. Elsewhere, the Ngwezumba pans are clay pans surrounded by mopane woodland that fill with water only during the rains). Further along, the upper reaches of the Chobe (here called the Linyanti) form the border with Namibia, spreading out across the desert to create marshlands that mirror the greater Okavango. Sitatunga and red lechwe bound through the shallows avoiding the snapping jaws of crocodiles, while the dry land is dominated by forests of giant jackalberry, sausage trees and ebony. The final area, Savuti, surrounds a distinct 100 km channel which sometimes runs dry and sometimes deep and true – the wildlife varies dramatically dependent on whether the water is there or not. We had been almost a month on a self-drive safari in Botswana and had had stunning wildlife sightings. The country had - once again - surpassed all expectations but we had one last aim. To see wild dogs would be the icing on the cake and we hoped that Chobe would deliver. Chobe is certainly one of the best elephant territories you will ever find - in fact the area suffers fairly heavily from vegetation damage caused by the great herds. Perhaps because of dense population the elephants can be more aggressive than elsewhere. The two Defenders in our convoy were seriously charged on two occasions (nerve-wracking but painless and without damage) and had half a dozen mock-attacks. In our last hour in the park we were following guide Bart Vanderpitte in the lead vehicle when suddenly he started shouting over the radio: "Dogs! Dogs! Dogs!" We watched a pack of about 8 wild dogs close in and kill an impala buck. Take my word for it: Chobe delivers! The Chobe riverfront is the premium wildlife-watching area of Chobe National Park and is accessible from the north of the country. It defines the border with Namibia and is only a short drive from Zambia. You won't be the only tourists in here but the loop roads off the main gravel track, along the riverfront, will get you away from the tour groups. It was the first park I visited in Africa after an absence. As I headed down to the river, a European roller bolted across the front of the car and a herd of impala grazed peacefully by the roadside, not long after I saw giraffe, zebra, plenty more antelope and a lone male lion. The highlight though was the elephant herds - they're huge and the best way to see them is to go down the river by boat. Guides will pull into shore when they see a herd drinking or bathing and you stop only metres away, close enough to touch...almost. It's a truly awe-inspiring and slightly terrifying experience. Chobe is one of the best places in Africa to see wildlife with high concentrations year-round, but especially so from April to October when the animals gravitate towards the riverfrontit’s especially good for lion, leopard and elephant. Chobe has more elephants than anywhere else on the continent. The most accessible (and hence most crowded) area is Chobe Riverfront, with vast herds, as well as lion, leopard and buffalo. A river safari is especially good for birdwatching. The Linyanti Marshes are more remote, and one of the last redoubts of the African wild dog; elephant, lion, leopard and buffalo are all possible. 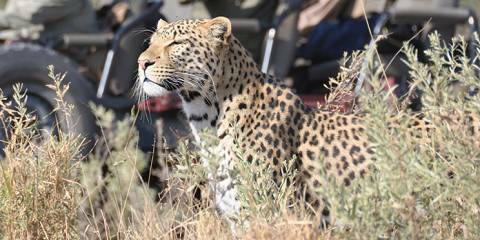 Savuti is more remote but boasts a stunning combination of open plains, riverine woodland and large rock monoliths that are known leopard haunts. At Gobabis Hill, one such monolith, has San rock paintings and an ancient baobab, and here I spent a morning alone with a pride of seven lions before the other vehicles arrived. And when I was last in the Savuti Marshes, I got up close and personal with a pride of 16 lions. Chobe lies at the confluence of four of Africa’s most popular wildlife destinations – Botswana, Namibia, Zambia and Zimbabwe. As such it’s a very popular park and can get crowded in high season. But what it lacks in wilderness vibe, it makes up in sheer density of game, particularly elephants (here in huge numbers from June to December), which are highly habituated to humans and entirely unbothered by the safari vehicles and boats that surround them. The focus of the park is the Chobe river, and a sunset or sunrise boat ride is a must. Boats, being quieter than cars, drift tantalizingly close to the wildlife on the banks, and the lower angle of a boat makes for amazing pictures. Game consists of a fantastic variety of wading birds (I’m not a bird expert, but those who are rave about Chobe’s 450 species), aquatic antelope (red lechwe are abundant here) and, of course, elephants. My boat driver and I convulsed with laughter as a herd of juvenile bulls dueled on the riverbank with some cheeky baboons, who retaliated to mock charges with a volley of dung-throwing. If you’re lucky (I was), a ele or two will take to the water near your boat, their heads streaming water and gleaming blackly in the sun as, trunks raised like snorkels, they make their way from one side of the river to the other. 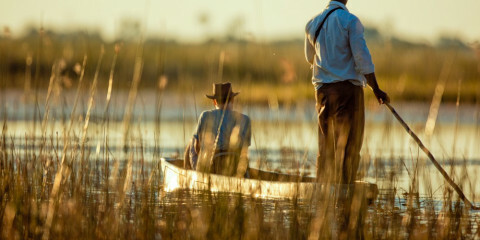 For even the oldest safari hands, arriving at the Chobe riverfront is a 'wow' moment. Herds of elephant cross the placid waters, giraffes munch riverside trees and, stretching out towards the horizon and the Namibian border, zebras, warthogs and antelopes scatter the flood plains. Making the scene supremely photogenic, a mokoro (dugout canoe) edges along as the sun sets and the river turns to liquid gold. This sight instantly refreshed my bloodshot eyes at the end of a long, bumpy drive through the Botswanan bush. After the Serengeti, Chobe is perhaps the best place in Africa for seeing wildlife in an open savanna setting. It also has an incredible 70,000 elephants, one of Africa's most concentrated populations; sadly, there was talk of culling when I visited. I certainly had some of my most memorable elephant sightings here, from up-close encounters to views of herds kicking up dust on the plains. The Chobe riverfront has the highest concentration of animals; there seemed to be a lion or leopard dozing under every other bush. However, its accessibility and proximity to Kasane mean it gets busy, so it's worth exploring quieter, 4WD-only areas of the park. Elephantophiles take note. If you want to get up close and personal with the lumbering giants of the African veld, then there is no better place on Earth than Chobe National Park. With an estimated 120,000 elephants roaming its bounds – which is the highest concentration of elephants on the African continent – even on the briefest of game drives you’ll be guaranteed several sightings. One herd we spied stretched further than the eye could see. But there’s much more to Chobe than elephant. 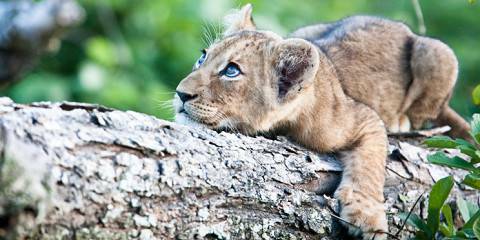 The third largest reserve in Botswana, it’s also home to lion, leopard, hippo, buffalo, wild dog, hyena and antelope. If you have the time, be sure to take a sunset cruise on the Chobe River. The stretch of river between Kasane and the Serondela campsite literally heaves with wildlife. And, of course, there’s no better way to end your safari than with an icy G&T in your hand watching the masses of hippos, elephants and crocodiles as the sun slowly sinks below the horizon. Pure bliss! Close to the Zimbabwean, Zambian and Namibian borders and an easy day trip away from the unmissable Victoria Falls, Chobe is Botswana’s flagship park and not without good cause. The wide and life-giving Chobe River draws incredible numbers of hippos, crocodiles, buffalo, waterbuck and a plethora of interesting bird species including the iconic African fish eagle and rare African skimmer. But the biggest attraction here is undoubtedly the unparalleled elephant population. I’ve witnessed single herds at least 200 strong and these beautiful giants can often be seen swimming across the river. A sunset boat cruise is a special way to enjoy Chobe’s elephants and its natural beauty, but for great pics and less boat traffic I prefer to be out on the river in the morning. I’ve also had the pleasure of staying a couple of nights on a houseboat on the river; it was a special treat watching great herds of game come to drink as I ate a delectable brunch on board. Game driving through the park can be a busy affair and I generally prefer to spend most of my time on the river. Though big predators like lion, leopard and wild dog are often said to be more frequently sighted further into the park, I saw my first successful lion hunt from the river on my first visit, and on my most recent visit I also saw lions trying (and ultimately failing) to take down a fully-grown elephant right by the river bank. If you love elephants, then you will love Chobe. During the dry season, safari goers are treated to endless processions of these grey behemoths drinking, swimming and frolicking in the perennial river. With thousands of elephants involved, this entertaining spectacle is best appreciated from the water and I strongly recommend taking a boat cruise along the Chobe River while you’re there. Elephants are unquestionably the main attraction, but the hippos, crocs and birding are also spectacular. The park is home to the full array of predators and lion prides in Chobe have adapted their hunting techniques to target both buffalo and elephants! These kills can be harsh to watch, but it’s a great privilege to witness Africa at her most primordial. If I were to single out one dislike, it would be that parts of Chobe – especially in the east along the river– have become very commercial and crowded. But, so long as you steer clear of these visitor bottlenecks, a highly rewarding safari experience awaits in Chobe. I’ve only been to Chobe once and my visit was limited to one night (the result of a very hectic itinerary) in the busiest area of the park near the Chobe River. It’s easily accessible from Vic Falls and has plenty of wildlife (particularly huge herds of elephants), so much so that you simply don’t know where to look next – but this also means that it has plenty of tourists. Boat trips are by far the best way to experience this part of the park, but the river too is busy at certain times, particularly for sunset cruises. High on my wish list are the Savuti and Linyanti areas, real wilderness regions away from the crowds. That’s not to detract from the beauty of the popular river area – but just be aware that there’s little bush solitude here… I would highly recommend staying for longer and exploring Chobe to its full potential.